Here at Droid-Den we get all kinds of android related goodies sent to us for review, and we hope you enjoy reading our thoughts on them as much as we enjoy playing with them! This year we'll be hosting a lot more giveaways too, including those android phones (oh yes!) and accessories we get the chance to take a look at. So starting us off this new year we'll be giving away the CaseMate Barely There case for the Samsung Galaxy Nexus that we reviewed last month! 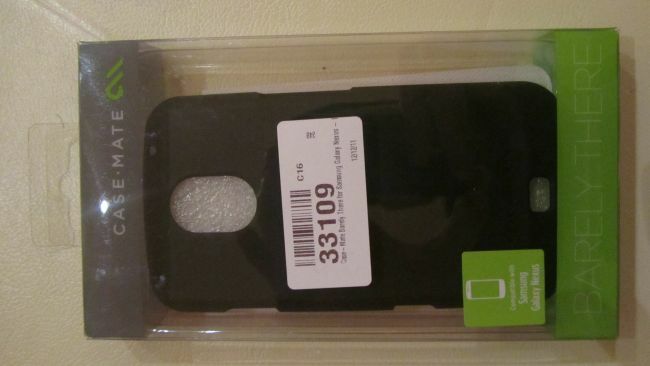 At the time we rated this as probably the best case available forÂ theÂ Galaxy Nexus, so you'll be getting your hands on a great accessory to help keep your Galaxy Nexus in top notch condition. The best news? ThisÂ competitionÂ is open to EVERYONE, and its very easy to enter. All you need to do is complete one of, or all of the steps below. You can only enter once using each step, but you can up your chances by completing every step! For each step, you need to include the answer to the following question. What DIY tool does the image included in the CaseMate Barely There packaging suggest the case is resistant to? If you need a hint, you can find the answer in our review! 1. Follow us on twitter, then tweet the following phrase on twitter, remember to replace <youranswer> with the actual answer! (Click here to auto-fill your tweet). 2. Add us to one of your Google+ Circles and re-share this post to your public circle together with the answer. 3. Like us on FacebookÂ and then post the answer to our wall! The competition is open immediately, and ends in exactly 1 week on Wednesday 11th January atÂ 11:59PM GMT. You may enter through each method once only. That means you can enter a total of 3 times, one each.